In the realm of belated sequels, the Bourne series is certainly not the worst of the offenders. When The Bourne Ultimatum appeared in 2007, I think that most assumed that this was the last that we would see of Matt Damon as the titular character. This seemed like even more of a certainty when The Bourne Legacy was released in 2012 with Jeremy Renner taking over as the lead (but not playing Jason Bourne). Now, Universal has decided to bring back the franchise and Damon in Jason Bourne. So, when compared to some other series, brining this character back after 9 years doesn't seem that bad. Right? Former CIA secret agent Jason Bourne (Matt Damon) is still on the run and off of the grid. He has been living in Greece, making money doing bare-knuckled fighting. Meanwhile, Nicky Parsons (Julia Stiles), an insider who has always helped Bourne, visits an underground computer site and hacks the CIA mainframe, where she finds files on Treadstone -- the covert op of which Bourne was part of -- and, more surprisingly, Bourne's father. CIA cyber expert, Heather Lee (Alicia Vikander), sees Nicky's activity and alerts her superior, Robert Dewey (Tommy Lee Jones). Nicky ventures to Greece to find Bourne and her movements are tracked by the CIA, who dispatch The Asset (Vincent Cassel) -- an assassin -- to stop them both. This action brings Bourne back out into the open and he becomes determined to learn more about his father. Thus begins a global manhunt, as Bourne fearlessly takes on the CIA. Jason Bourne gets off to a rocky start, as it assumes that we remember the first three Bourne films very well. I know that I've seen The Bourne Identity, The Bourne Supremacy, and The Bourne Ultimatum, but, to be honest, those second two films are sort of melded together in my mind and I don't remember them very well. I had assumed that I could go into Jason Bourne with a recollection of the most basic information and that I'd be fine. And while the film's opening is pretty straight-forward, once it dives into the details of "Treadstone" and "David Webb", I realized that I probably should have re-watched at least the last film. But, doing that may have also driven home what a re-tread (Re-Treadstone?) Jason Bourne is. There's a fine line between giving the fan-base what they want and not doing anything new, and this film leans towards the latter. Here we have yet another movie where Jason Bourne beats up some people, is involved in a car chase, and threatens people so that they will give him information. Save for the presence of some new actors around Damon, this looks just like the other movies. The lack of originality is outpaced only by the lack of a real story. Once Bourne decided that he's back in action, the movie hopes that it can distract us with action sequences and that we won't notice that very little is going on here. Along with the fight scenes and two, yes two, overly-long car chases, we get a subplot involving tech guru Aaron Kalloor (Riz Ahmed) which literally goes nowhere. I can only imagine that the script said something like, "Action, action, action, Bourne says something, action, action, action". But the action is simply dull and never involving. The most positive thing that I can say about Jason Bourne is that Director Paul Greengrass has finally ditched his obsession with shaky-cam. One thing which I do remember from The Bourne Supremacy and The Bourne Ultimatum was that the camerawork made me sick. While Greengrass has returned to helm Jason Bourne, he has shot the film in a much more user-friendly style. Other than that, this movie is simply more of the same. I like Matt Damon and I like action movies, but this film simply ticks the boxed on the spy-movie checklist and has no interest in doing anything different. It's simply one scene after another of the viewer saying, "I thought he already knew that." 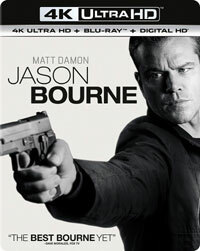 Jason Bourne already can't avoid car chases on Blu-ray Disc courtesy of Universal Studios Home Entertainment. The film has been letterboxed at 2.35:1 and the Disc contains an AVC 1080p HD transfer which runs at an average of 32 Mbps. The image is very sharp and clear, showing no overt grain and no defects from the source materials. The colors look good, although we get few bright tones here, and the image is never overly dark or bright. The level of detail is notable and the depth looks good. The Disc carries a DTSX (DTS-HD Master Audio) 7.1 track which runs at 48 kHz and an average of 8.0 Mbps. The track provides clear dialogue and sound effects. This Disc offers the highest bitrate that I've ever seen. The surround sound effects are very detailed and active, and we can easily pick out individual sounds. The stereo effects are also impressive, showing off sounds coming from off-screen. The subwoofer effects act a punch to the action sequences. This release also includes a 4K Ultra HD Disc where the film has been letterboxed at 2.35:1 and the Disc features a 2160p HD transfer. The image is incredibly sharp and clear, showing no grain and no defects from the source materials. The thing that's really noticeable here is the sharpness and the level of detail. We don't get the depth and vibrance of something like the 4K release of The Secret Life of Pets, but it certainly has a cleaner look than the Blu-ray Disc. This Disc contains the same DTSX 7.1 audio track as the Blu-ray Disc release. The Jason Bourne Blu-ray Disc contains a few extra features. "Bringing Back Bourne" (8 minutes) opens with the actors stating that the public is clamoring for another Bourne movie. Really? This then goes into an overview of how they decided to do a new movie and how the production came together, and what it was like for Bourne to return years later. (And they describe a movie which really isn't what we get with the finished product.) "Bourne to Fight" (18 minutes) is a three-part featurette -- "Bare-Knuckle Boxing", "Close Quarters", "Underground Rumble" -- which examines the hand-to-hand combat in the film. We see how Damon trained for this and the choreography involved. "The Athens Escape" (6 minutes) takes us on-location to examine the film's first big action sequence, which involved motorcycles on real-life streets. "Las Vegas Showdown" (15 minutes) is a two-part piece that allows us access to the Strip to observe how the film's climactic sequence was staged and how parts of the busy city were shut down for the movie.